There’s no news here: It goes fast. The kids are growing up, and each year seems to be faster than the last. I think most of us feel that way. But lately, I’ve been more aware of time flying by than ever before. Maybe it’s my oldest heading off to college 2 months ago–or her younger sister starting her own college search this fall–or my youngest starting middle school. Or maybe it’s my own march into my late 40s? A couple of weeks ago, my high school junior’s school had a spirit day for the Orioles’ playoff run. 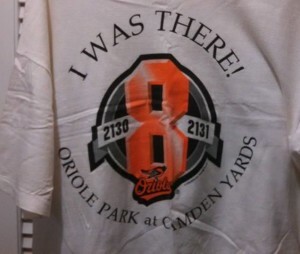 She is not big on fan gear, so when she could not come up with anything orange & black, I had the answer: in 1995, 3 months before we first had a baby in the house, I went to the game at Camden Yards where Cal Ripken tied Lou Gehrig’s consecutive games streak at 2,130. I bought a t-shirt that says, “I WAS THERE!” and decided not to wear it, but to save it for the right time down the road. It was time: I dug it out of our keepsake collection, and Ms. 11th Grade was all set for school. 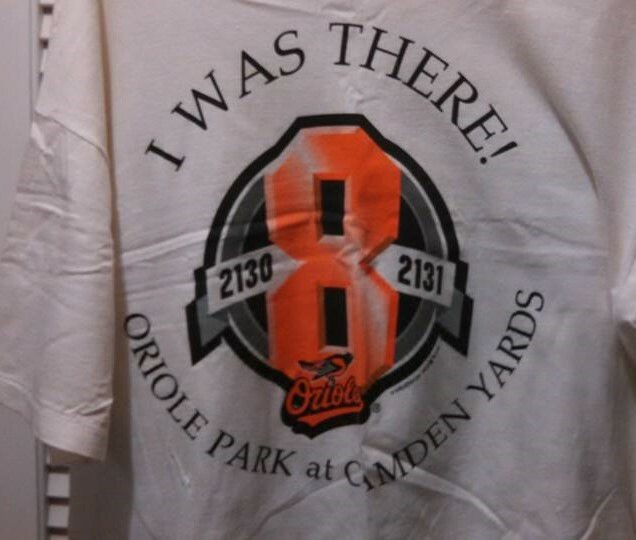 A former student–a rabid O’s fan, now in her early 30s and a Facebook friend–saw my post about this and commented: “I believe you told me when I wore mine to school the next day, ‘I’m saving it for my kids.’ So, nicely done.” A warm shared memory, but how in the world has it been 19 years since that game? And how is my student already a teacher and a mom of two toddlers? Then a college friend’s birthday showed up on Facebook earlier this week, and he made a comment that had not occurred to me: His kids are closer to 30 than he is. I realized this is true for my 2 older kids, as well. 30 is that far away?! I remember teaching The Great Gatsby when I turned 30 myself, along with Nick Carraway, and the charge of sharing his feeling that “I’m 30. I’m 5 years too old to lie to myself and call it honor.” And now my girls are closer to that than I am. Don’t get me wrong: I’m not depressed. I’m not sad. But I am in awe of how much we’ve done and how quickly the time has passed. And if I can’t put the breaks on time passing, at least I’ll always have this: I WAS THERE.